I’ve discussed the Credit Suisse Global Wealth Reports before, an excellent source of data for both wealth and wealth inequality. The most recent edition, from November 2016, shows the United States getting wealthier, but steadily more unequal in wealth per adult and dropping from 25th to 27th in median wealth per adult since 2014. Moreover, on a global scale, it reports that the top 1% of wealth holders hold 50.8% of the world’s wealth (Report, p. 18). One important point to bear in mind is that while the United States remains the fourth-highest country for wealth per adult (after Switzerland, Iceland, and Australia) at $344,692, its median wealth per adult has fallen to 27th in the world, down to $44,977. As I have pointed out before, the reason for this is much higher inequality in the U.S. In fact, the U.S. ratio of mean to median wealth per adult is 7.66:1, the highest of all rich countries by a long shot. The tables below illustrate this. First, I will present the 29 countries with median wealth per adult over $40,000 per year, from largest to smallest. The second table also includes mean wealth per adult and the mean/median ratio, sorted by the inequality ratio. Now that I’ve got your attention, let me remind you why this low level of median wealth is a BIG PROBLEM. Quite simply, we are careening towards a retirement crisis as Baby Boomers like myself find their income drop off a cliff in retirement. As I reported in 2013, 49% (!) of all private sector workers have no retirement plan at all, not even a crappy 401(k). 31% have only a 401(k), which shifts all the investment risk on to the individual, rather than pooling that risk as Social Security does. And many people had to borrow against their 401(k) during the Great Recession, including 1/3 of people in their forties. The overall savings shortfall is $6.6 trillion! If Republican leaders finally get their wish to gut Social Security, prepare to see levels of elder poverty unlike anything in generations. It will not be pretty. Let’s move now to the inequality data, where I’ll present median wealth per adult, mean wealth per adult, and the mean-to-median ratio, a significant indicator of inequality. These data will be sorted by that ratio. As you can see, the U.S. inequality ratio is more than 50% higher than #2 Denmark and fully three times as high as the median country on the list, France. As the title says, this is not even close. The message couldn’t be clearer: Get down to your town halls and let your Senators and Representatives know that it’s time to raise Social Security benefits and forget the nonsense of cutting them. We’ve gotten to another point where it’s hard for me to turn on the TV. I know this will have to change, but for now I’ll go back to one of my favorite topics, the fate of Ireland under austerity. As I suggested might happen, Ireland in its 2015-2016 immigration statistical year (May-April) was finally able to end its net emigration. According to the Central Statistical Office’s August report, 3100 more people came to Ireland than left during 2015-2016. This was the first time since 2008-2009 that Ireland had net in-migration. Still, among the Irish themselves, net emigration continued in 2015-2016, with 10,700 more leaving than returning. While Q3 2016 employment increased by 57,500 to 2,040,500, this remains 5.6% below its Q1 2008 peak of 2,160,681. Things are finally getting better, but Ireland is still not all the way back. By contrast, currency-devaluing, banker-jailing Iceland long ago passed its old employment peak (create your own table), which was 181,900 in August 2008. Employment reached a low point of 163,900 in February 2011, first surpassed the old peak in February 2015 (182,900), and in December 2016 stood at 194,400, or 6.9% above the pre-crisis peak. Oh, and Iceland’s unemployment rate? A seasonally adjusted 2.9% in December 2016, and only 2.6% without seasonal adjustment. Maybe one day we’ll talk about the Celtic Tiger again. But Ireland, hamstrung by its inability to devalue and by harsh austerity measures, shows lingering weakness, masked by emigration, to this day. Iceland, by contrast, is the one looking like a Nordic Tiger. As I explained last week, Donald Trump was elected to the Presidency despite having fewer votes than Hillary Clinton. She has already set a record for the biggest popular vote victory despite losing the Electoral College; according to CNN, she now (11/17/16 5:00am EST) leads by about 1,045,000 votes, roughly twice the margin of Al Gore’s victory over George W. Bush in 2000. This equates to 0.8% of the popular vote. Moreover, Clinton’s lead will only increase in the coming days. The CNN infographic cited above shows that only 78% of California’s votes (where Clinton leads by roughly 3 million votes) have so far been counted. Her raw vote margin will continue to climb there until the votes are all counted. People have raised two primary arguments against my position that having the Electoral Vote trump the popular vote is undemocratic. The first takes the view that Trump won under the rules as they are: If the popular vote were determinative, he would have campaigned more in California, New York, Texas, and other population centers, and, in his mind at least, he would have recorded an even bigger victory. The problem for this claim, as Josh Marshall has pointed out, is that Clinton would have also campaigned more in those states. Increasing voter turnout usually improves Democratic electoral fortunes, so electing the President by popular vote means that Democratic margins would increase, not decrease. The second argument claims that focusing on the Electoral College as the reason for Clinton’s loss lets her off the hook for her weaknesses as a candidate and a campaigner. And there is no doubt that she had her weaknesses. The problem with this view is that the existence of the Electoral College is a necessary condition for her to have lost. None of her campaign’s other problems would have led her to lose the election if the Electoral College did not overweight the Wyomings of this country relative to the Californias. This structural disadvantage that populous states face is one of the biggest threats to democracy in America. And we’ve got to do something about it, soon. Update: It’s now over 1.5 million, according to CNN. California still only has 83% tallied. Some sources have Clinton’s lead over 2 million now. Something is seriously wrong with this picture. For the second time in just 16 years, the new President is actually the loser of the national popular vote (click on “Popular Vote”). This is the fifth time this has happened in U.S. history; the last time it happened prior to 2000 was in 1888. As children, we were all taught to believe in democracy and majority (or as we later learned, sometimes just plurality) rule. But with the way that rural and low-population states are overrepresented in the Senate and, hence, the Electoral College, the United States has persistent problems in achieving democratic outcomes in presidential elections and in passing legislation (the overrepresentation of small states in the Senate is amplified by the use of the filibuster). As I write this (Nov. 9 at 3:53 EST), Hillary Clinton presently has a 219,000 vote lead, according to CNN (see link above). Yet she has lost the Presidency because low-population states are overrepresented in the Electoral College. How do we avoid such affronts to democracy in the future? The best, and most straightforward way to do this would be to abolish the Electoral College entirely. This would make it impossible to repeat this travesty again.However, the Amendment process is a difficult one, requiring 2/3 majorities in the Senate and House of Representatives, and approval by 3/4 of the states. There is an alternative, though it might not be permanent. This is called the National Popular Vote bill, which would take the form of an interstate compact that would come into effect when it was ratified by states wielding at least 270 electoral votes. The concept behind the bill is simple: The states which are members of the compact pledge to award all their electoral votes to the winner of the national popular vote (50 states plus the District of Columbia), rather than the winner of the popular vote in their own state. This would ensure that the popular vote winner also won the Electoral College. However, this solution might not be permanent, if one or more of the signees passed legislation withdrawing from the compact. At present, states comprising 61% of the needed 270 electoral votes have signed on to the agreement. This is made up of ten states plus the District of Columbia, with 165 electoral votes. A quick glance at the list shows the biggest potential problem: Every one of them voted for Secretary Clinton last night (although it should be noted that the Republican-majority New York State Senate voted in favor of the bill 57-4). Although there is some bipartisan support for the bill, Republicans in other states could decide that keeping the Electoral College is a partisan advantage, making it impossible to get enough states to sign on. And yet, one of these (or something with equivalent effect) solutions is needed. American democracy is being degraded by our inability to elect as President the candidate with the most votes. It has now happened in two of the last five Presidential elections, and continues to be a threat for the foreseeable future. At least, they usually do. As I have related before, American Express in 2010 announced a $400 million data center in North Carolina, without incentives. But fear not, Amex had not forgotten about using the site selection process as a rent-seeking opportunity. The reason it did not seek incentives, as far as anyone can tell (don’t forget about the inherent information asymmetry here), is that the company knew it was going to close a 1900-job call center in Greensboro, which would trigger clawbacks on the data center if it received subsidies for it. So in that case North Carolina gave no incentives for the server farm. Not only that, Google knows how to build and expand data centers without incentives. Of course, that’s in Europe. The Netherlands Foreign Investment Agency confirmed for me that it gave no subsidies to Google for a $773 million, 150-job center opening in Groningen province next year. I was unable to get affirmative confirmation on projects in Ireland, Finland, and Belgium, but none of them show up in the EU’s Competition Directorate case database, so presumably they did not receive incentives either. The study concludes with sensible recommendations: Transparency where it doesn’t exist, capping incentives at $50,000 per job, and knowing when to get out of subsidy auctions for these projects. Maybe simpler still, I would suggest that economic development officials just say no. I have argued many times (most directly here) that, contrary to the claims of nearly all Irish policymakers, low taxes are not what makes the Irish economy tick. The country experienced 30 years of low taxes with no gain on average European income; it was only after 1987 that other policy changes (education, EU-funded infrastructure, and Social Partnership) led to gains on the EU average. Thanks to a Tax Justice Network blog post, I now have a great illustration to show this in living color.The graph below plots Irish income per capita as a percentage of the EU average from about 1955 to 2012, with important dates noted as vertical lines. Notice that Ireland doesn’t get above 60-65% until after 1990. 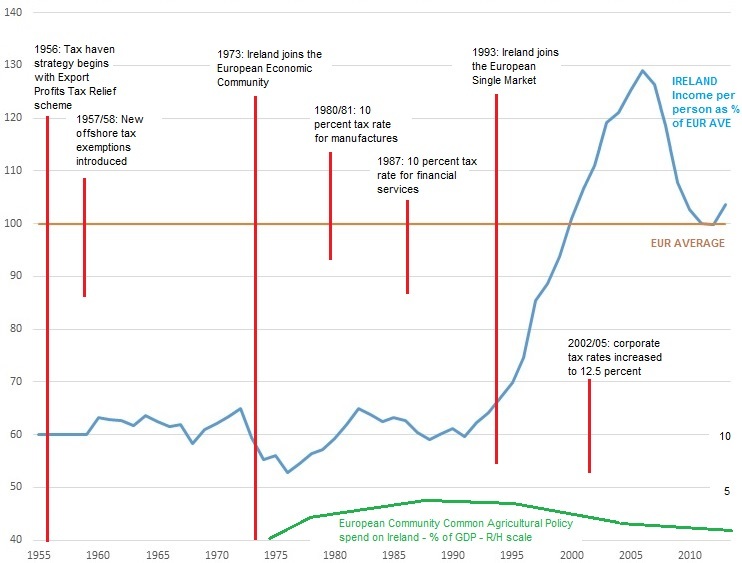 In addition, the Commission-enforced increase in the corporate income tax rate from 10% to 12.5%, which took effect in the early 2000s, had no impact on the Celtic Tiger’s spectacular rise in income per capita relative to the EU average. This means Ireland had higher growth when the tax rate was 12.5% than when it was 0%!Q.E.D. $19 billion? $8 billion? A few hundred million? Estimates are all over the map regarding the European Commission’s imminent decision on whether Apple received illegal, unnotified state aid (subsidies) from Ireland. As I mentioned two years ago, two factors go into the Commission’s claim: Ireland’s creation of a corporate entity that is taxable nowhere, and the possibility that the company negotiated a tax rate far below the country’s already-low 12.5% corporate income tax rate. As you may remember from earlier posts, if the Commission rules against Apple, the sanction it will impose will be the repayment of the illegal subsidies, with interest. Some estimates of Apple’s tax savings are astronomical (the New York Times reported an estimate Apple saved $7.7 billion in 2011 alone), which creates the possibility of an extremely high repayment order. On the other hand, recent cases have seen relatively low repayments, such as the mere €30 million the Commission ordered Starbucks to repay the Netherlands last year. Still, it is perfectly possible that the Commission used smaller cases as a way to establish the legal precedent regarding fiscal aid before dropping the bomb on Apple. It’s worth noting, as reported by Bloomberg, that the largest state aid repayment order ever made was approximately €1.4 billion charged to Électricité de France, followed by two orders in the €1 billion range. When this decision is announced, we may see a new record by a large margin. Or maybe we won’t. Either way, the Commission will be giving us a clear sign regarding how seriously it intends to treat fiscal aid abuses. Update: For a little perspective on fines, Chillin’ Competition (via email) points out that the European Commission has just imposed an anti-trust fine on four truck manufacturers of over €2.9 billion , a new record. This month’s enhancements to the database bring it to a once-unimaginable 500,000 individual incentive awards with a cumulative nominal subsidy value of $250 billion! That’s starting to add up to real money! I explained two years ago how to use the data from Megadeals or Subsidy Tracker to compare a proposed economic development incentive package with past subsidies given in the same industry to get some idea whether the proposal represented a gross overpayment for a given investment. This method relies on finding good matches by industry, location, unemployment rate, and so on. The more deals available to search means your chances for finding good comparables improves proportionately. This can only enhance the ability of citizens’ groups, labor organizations, etc., to independently analyze proposed costly incentive packages. As Philip Mattera, Good Jobs First Research Director, says, the steady expansion of Subsidy Tracker “reflects the improvement in government transparency over the past decade.” I can personally remember when the first statewide transparency law was passed in Minnesota in 1995; transparency has improved exponentially since then, although there is much progress that still needs to be made. Although transparency remains an elusive goal, it’s worth celebrating successes when they occur. Cheers! If you’ve been following my posts over the last few years, you know that Iceland took the dramatic step of prosecuting top officers at the country’s big 3 banks, all of which were allowed to go bankrupt in the wake of the 2008 financial collapse. Unlike Ireland, it did not turn bank debt into government debt, which increased Ireland’s debt by close to 100% of gross national product (GNP) overnight. Though hit hard by the 50% drop of the krona, Iceland has managed a remarkable, though still incomplete, recovery marked by its renewed ability to borrow in foreign currency with less than a 1% risk premium and by achieving unemployment rates that Eurozone countries can only envy. What you wouldn’t know, if you just been looking at the headlines (Google “Iceland jails bankers” and you’ll see what I mean), is that Iceland had not actually been jailing bankers. Here’s a typical one from the BBC, “Iceland jails former Kaupthing bank bosses” (12 December 2013). In fact, nobody went to jail at that time: They were convicted, but all four Kaupthing officials appealed their sentences. If you search similarly titled stories, you will see that headline “jailings” were either convictions, or an affirmation of these lower court decisions by the Icelandic Supreme Court, neither of which actually led to immediate jailings. Indeed, one of the “Kaupthing Four,” as they are now called, was living in Luxembourg (he had headed Kaupthing’s Luxembourg branch), and I wondered to myself if could even be compelled to return to Iceland to serve his sentence. Now I am happy to report that the Kaupthing Four are finally in jail in a minimum-security prison with only one road connecting it to the outside world, including the former CEO of Kaupthing’s Luxembourg unit who was outside Iceland when his conviction was upheld. There have been an additional 22 convictions now at various stages in the appeals processes, and special prosecutor for the banking crimes, Olafur Hauksson, indicted five more bank officials for fraud and manipulating stock prices just last month. As Kaupthing was Iceland’s largest bank before the crash, jailing its top officials sends a reassuring sign that the rest of those convicted will eventually follow suit. Iceland thereby establishes a precedent we should continue to urge in the United States, United Kingdom, and elsewhere that bankers are not too big to jail. A note to readers: Bloomberg reporter Edward Robinson had not replied to a request for some clarifications at the time this story was published. If any of you know when the Kaupthing Four reported to prison, whether there are other bankers already in jail, or other useful news, please send along the information and I’ll be happy to credit you. Thanks! That’s certainly a clue: Some of the changes do require legislation, and getting that from the Republican Congress is not going to happen. In fact, Republicans have always been willing to step up to keep the United States a tax haven for foreigners, and the Bush Administration went out of its way to undermine previous OECD attacks on tax havens offshore, as Australian political scientist Jason Sharman masterfully showed in his book Havens in a Storm. Republicans have done such a good job at helping out domestic tax havens that the United States is now “The World’s Favorite New Tax Haven,” according to Bloomberg Businessweek which, in an ironic coincidence, published the story at 12:01AM the day the MCAA was signed (so it didn’t report on the signing either). According to the article, foreigners’ money is pouring out of Swiss banks into the United States, and Rothschild has set up shop in Reno, Nevada. UPDATE: @AlexParkerDC from Bloomberg BNA was kind enough to send me to a couple of his posts on the OECD’s Base Erosion and Profit Shifting (BEPS) negotiations. These suggest that the Obama Administration believes it can implement country-by-country reporting through regulation alone, and had already committed to it in the BEPS process. However, the IRS has proposed not to implement country-by-country until 2017, while the new OECD agreement begins with this year’s tax information, as noted above.